“But I heard that tooth-colored fillings contain BPA,” you’ll hear some folks say – as if that somehow negates all concern about the mercury in amalgam fillings. And yes, it’s true: Most composite resins available today do contain this endocrine-disrupting chemical or related compounds. One recent study found that of the 130 products its authors looked at, over 86% were based on BPA derivatives. Just 18 composites were free of those compounds. 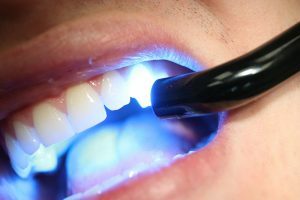 Obviously, this is of some concern, especially since these materials are used not just for fillings but sealants, which are often recommended for children at high risk of decay. Research suggests that BPA may affect how reproductive systems and brains develop. Exposure to this chemical has also been linked to a wide variety of problems, including early puberty, metabolic disorders such as obesity and diabetes, heart disease, infertility, thyroid dysfunction, and some cancers. The good news is that, under normal circumstances, your body is able to excrete BPA pretty well. The bad news is that we’re each exposed to so much of it every day, we may not be able to clear it so efficiently. BPA is a fat-soluble compound and may accumulate in the fatty tissues of your body. In fact, over 90% of us contain measurable amounts of BPA. Suffice it to say, it’s a good idea to minimize the amount we’re exposed to, including that in dental work. Another option is ceramic. It’s broadly biocompatible, BPA-free, and can be used for inlays, onlays, and crowns. And if you – or your child – has already had fillings or sealants placed that aren’t BPA-free? Unlike with mercury amalgam, there’s little to gain by removing them. Most BPA exposure happens when the fillings or sealants are placed. Research has consistently shown that while initial BPA levels may be elevated, they quickly plummet. One of the most recent studies found that salivary BPA levels were near zero after 7 days. Similar results have been found for fluoride released from composite: The main exposure is at the time of placement and dwindles rapidly. The main thing, going forward, is just to make sure that any future fillings or sealants are in fact BPA-free. To learn more about BPA and related compounds in dental materials, check out this presentation by Jess Clifford.